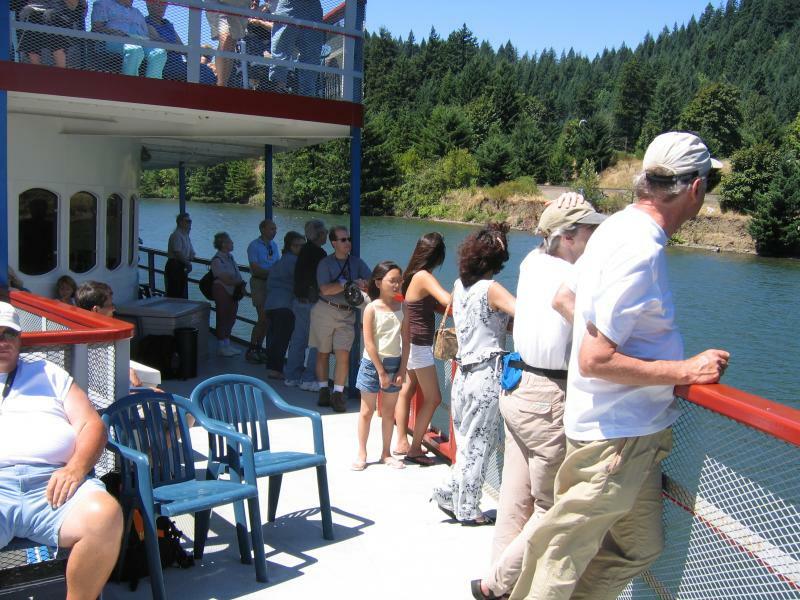 The bus drove futrher into the gorge till we came to a dock where we are to board this loveley stern paddle wheel boat for a delightful 2 hour ride. Rose, Kirk and Sarah waiting to board the boat. It as great fun, and a beautiful day. We were traversing over what had been the most treacherous part of gorge, known as the cascades, These deadly rapids are now covered by the water that is backed up behind the famous Bonneville Dam. 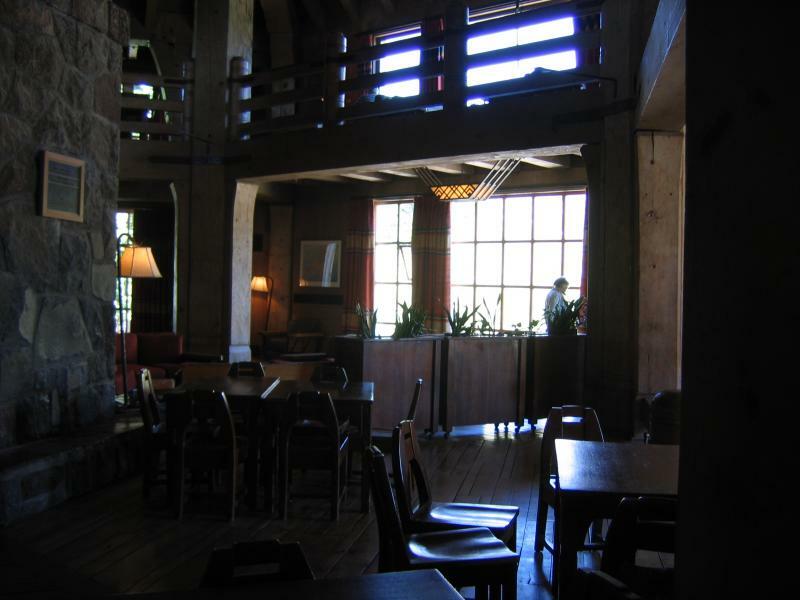 It was built during the height of the Great Depression, the first one built on the river. 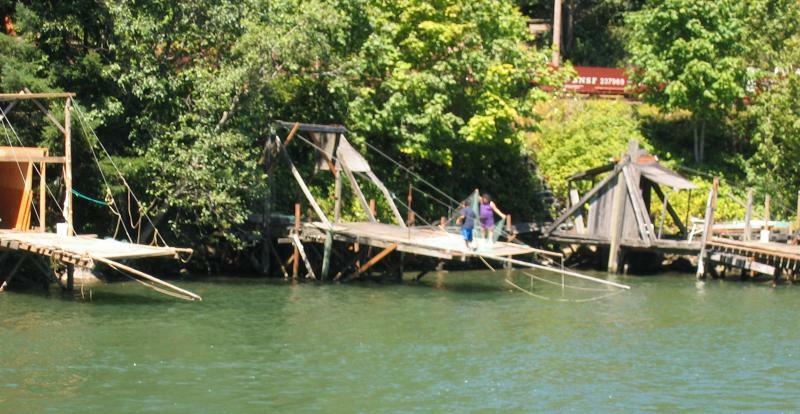 The Indians have very special treaty rights that permit them to fish for salmon from these platforms along the banks. They are not subject to any of the fishing restrictions that apply to the rest of us. Some of they have little stands along the road where they sell the salmon to passing customers. A happy group right ar the bow of the boat. 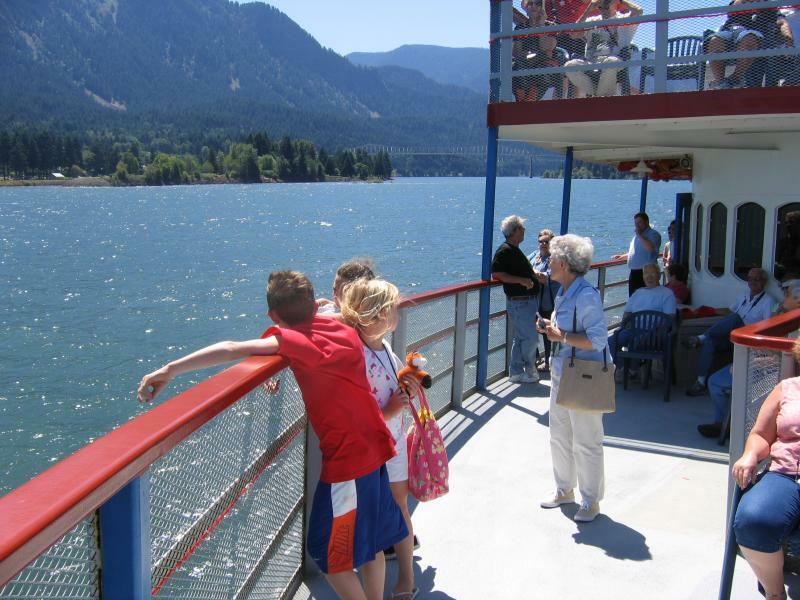 And here is our next stop, Bonneville Dam. 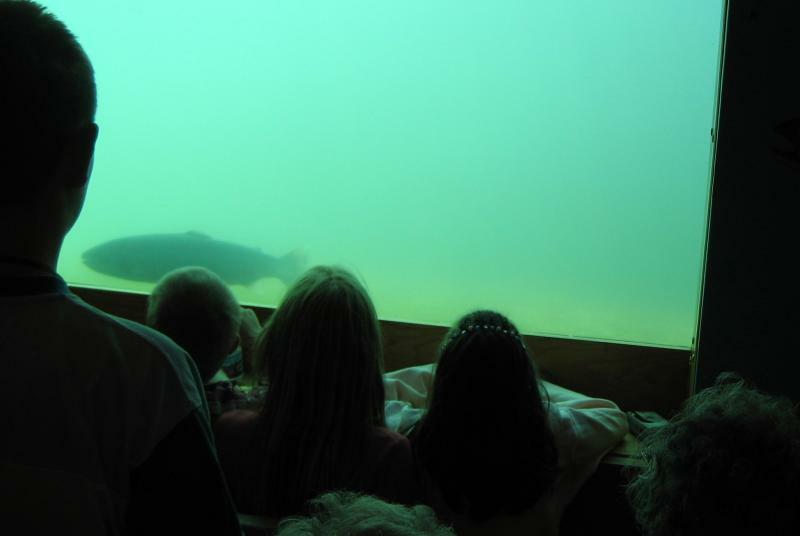 We are now inside the dam looking at an underwater view of the fish ladder. There were not many fish to see, partly because this was not the time of year when the major salmon runs occur. 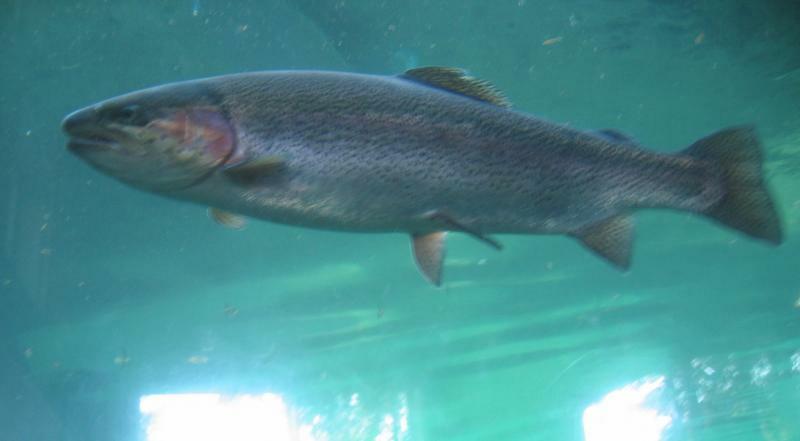 And, of course, the salmon populations are greatly depleted from early years. Here Rose and Marie are viewing the main hall in the dam's power plant. 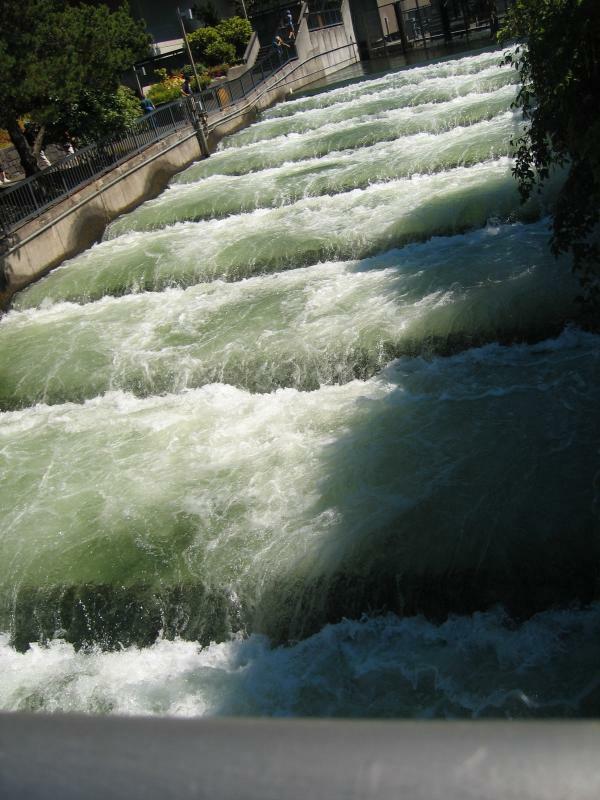 There are many huge generators that are driven by the water rushing through huge turbines that are built below each generator. 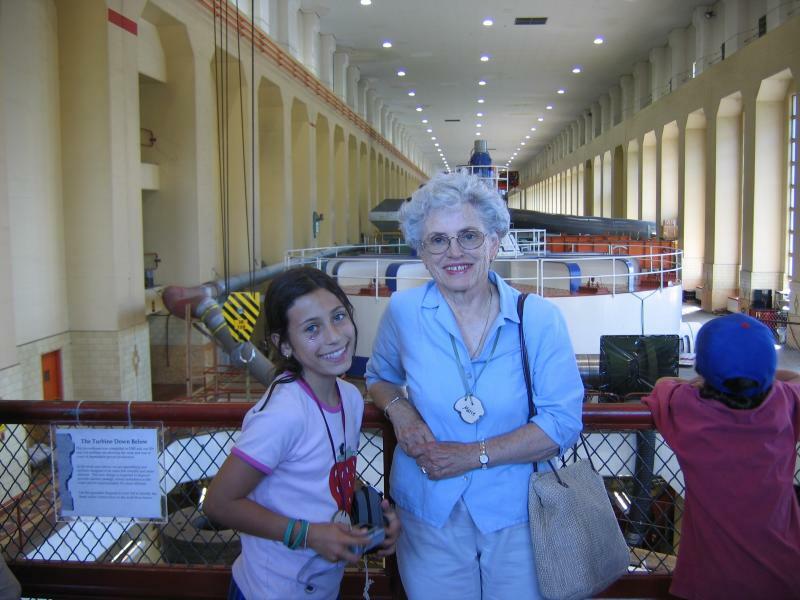 We told Rose about the important work that Marie's father, Shirl, did, designing power switching and control equipment for these huge dams. 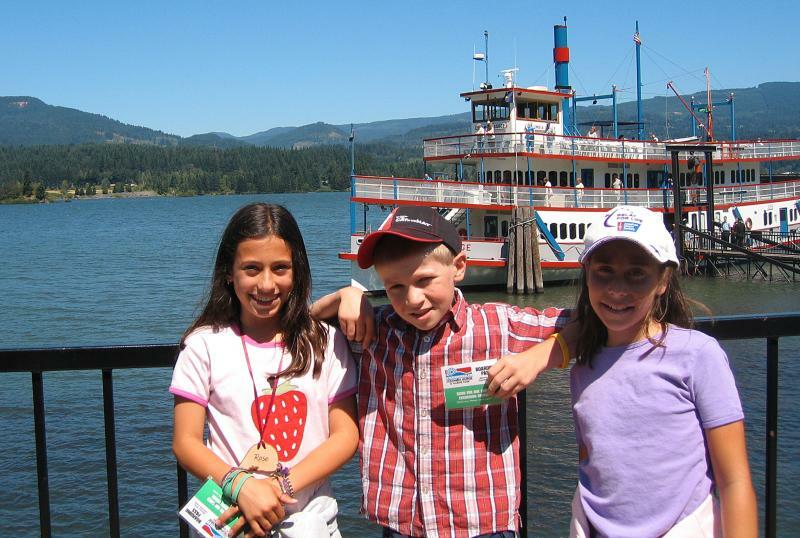 After leaving the Dam, the bus took us to a nearby fish hatchery, where we had a great time exploring. 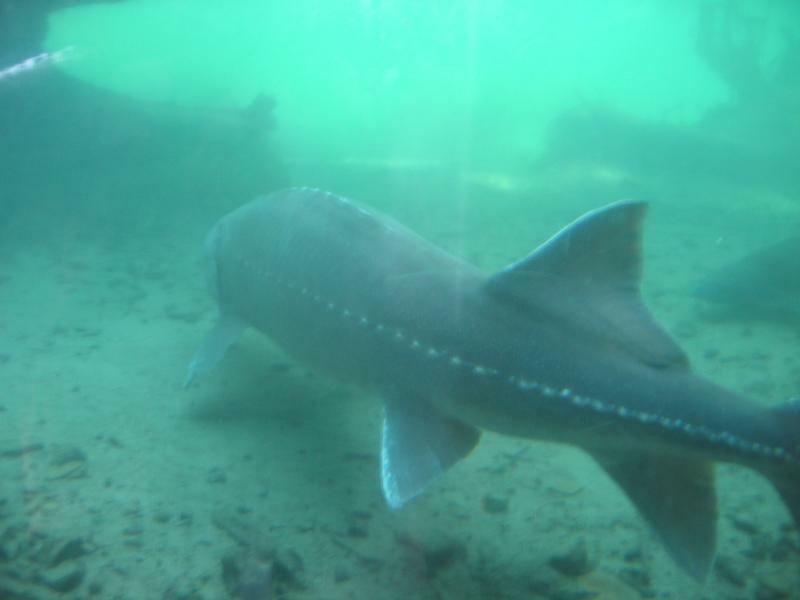 There was a large pool where we saw this great old White Sturgeon. There are many in the river and they get to be very large. 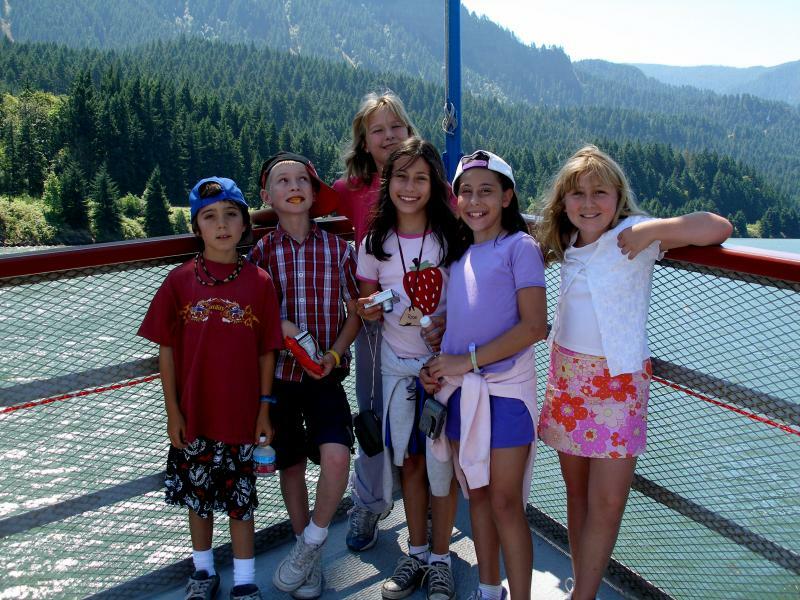 After completing our exploration of the Gorge, the bus drove up the river to where it was joined by the Hood River. There we entered a town, which, surprisingly, is called "Hood River". We then moved into a very nice Comfort Suites hotel, and rested briefly before all the kids headed to the nice indoor pool. I went along to help keep an eye on things, but what earsplitting noise and furious activity as they all unwound! We piled back on the bus for a short ride to a nearby restaurant, where we had a nice dinner. 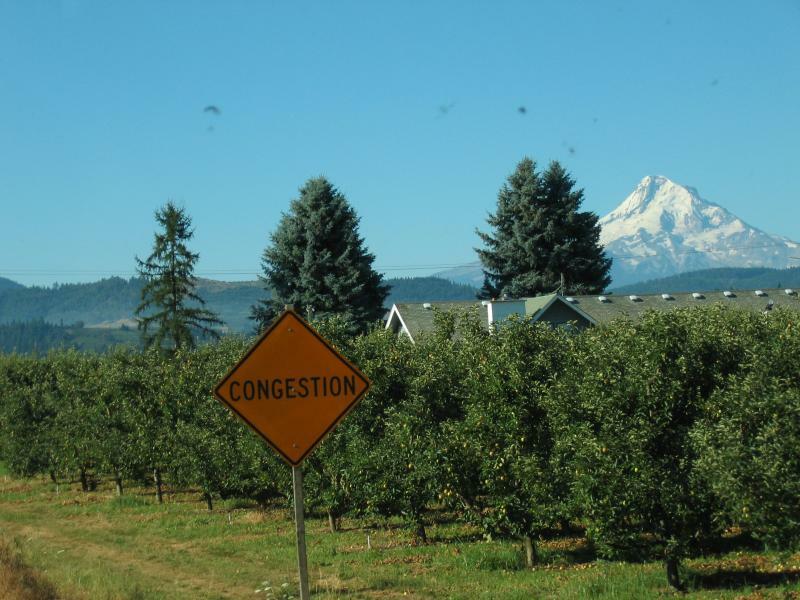 The next morning we continued up the Hood River, planning to go up and around the East side of the mountain, Here we we see some of the famous Oregon orchards, with Mt Hood in the background. 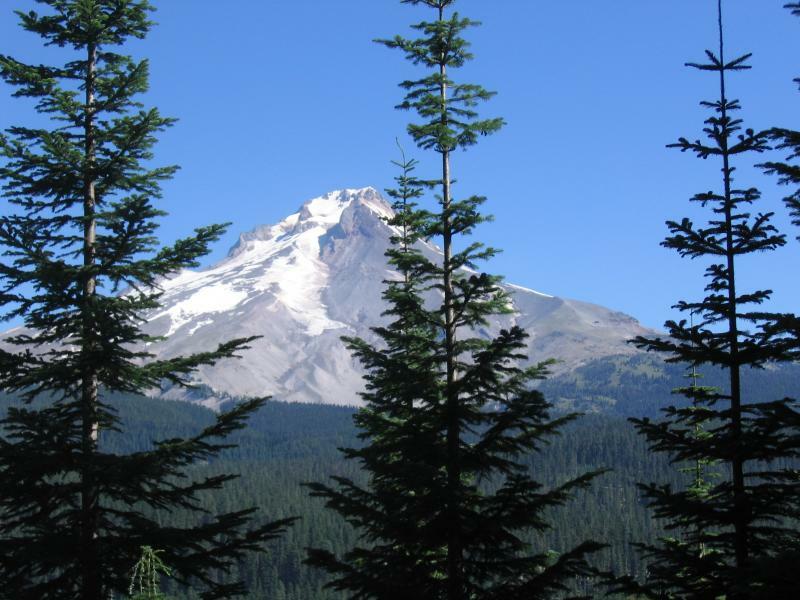 A nice view of Mt Hood. Since it is a rather symetrical volcanic cone, standing all by itself, it is very impressive. We are on our way up to the timberline area. 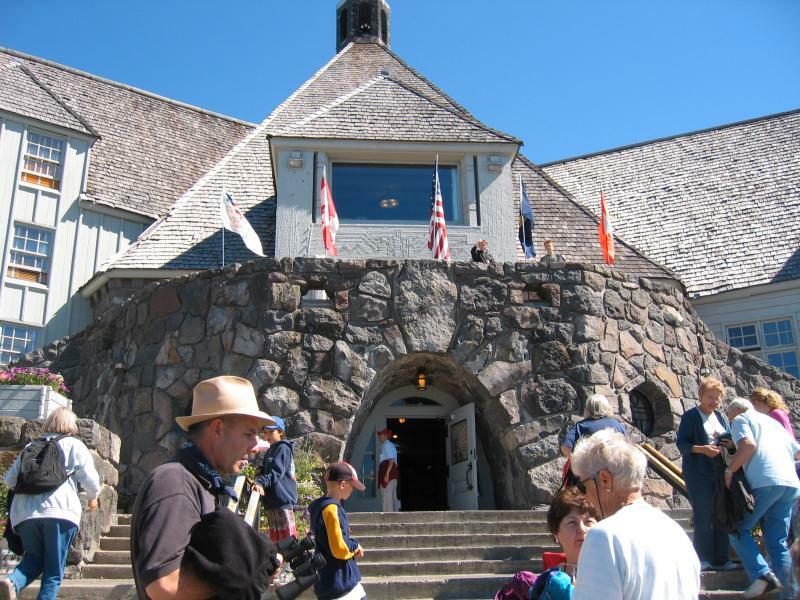 Here is the main entrance to the Timberline Lodge. This was built as a way for the government to provide jobs for the unemployed during the height of the Great Depression. I believe it was finished in 1937 and President Roosevelt gave the dedication speech, over radio, in September 1937. 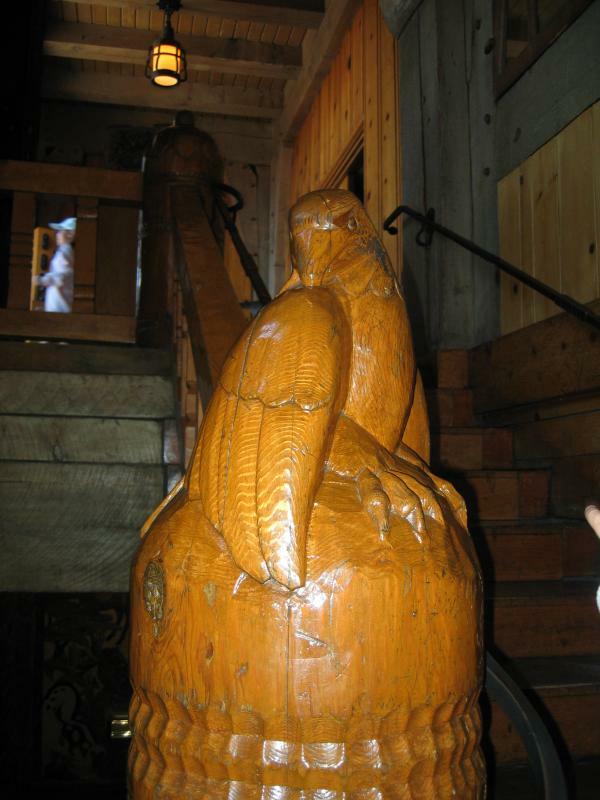 It was built of native materials wherever possible,by local craftsmen. Here is the beautiful main lounge. Even the furniture and the fabrics were made by local craftsmen and women. Some of the materials were woven by persons living in Portland. 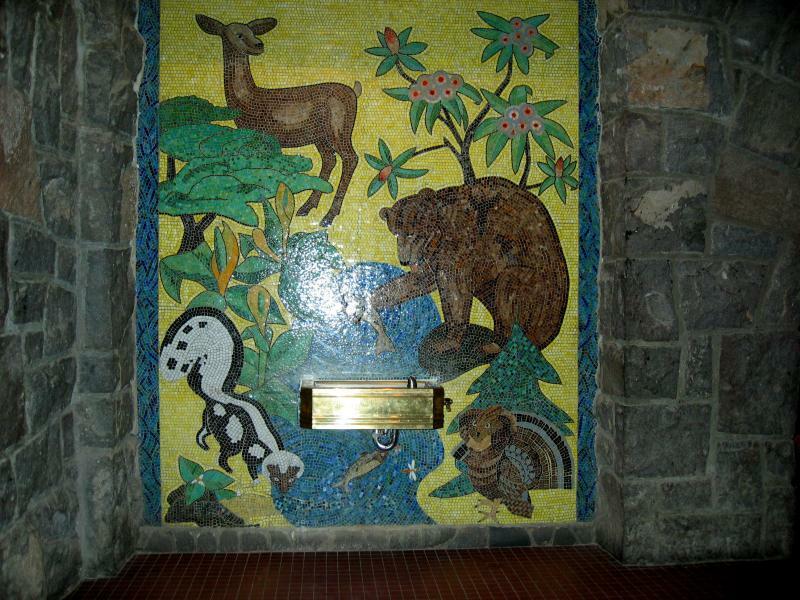 Many paintings and other art were commissioned from outstanding local artists. There are many exampless of beautiful carvings like this. 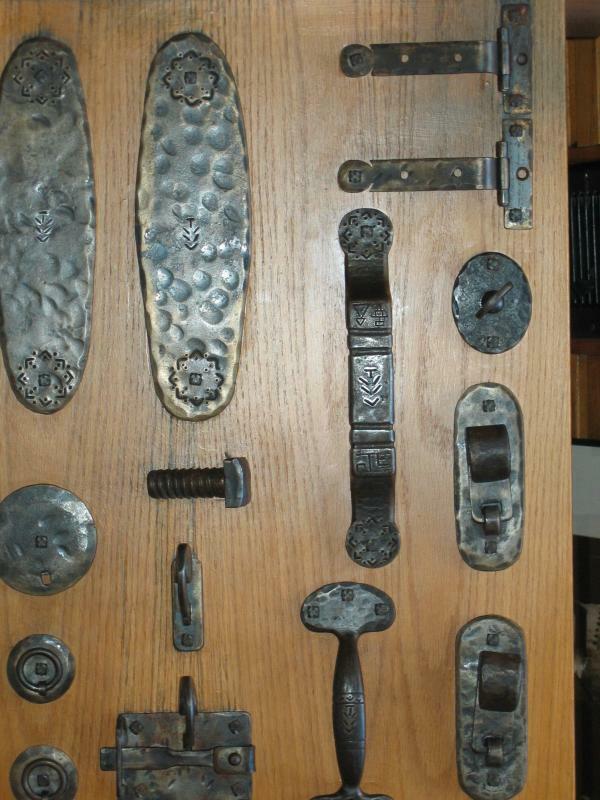 Here are some examples of the many fittings and implements made locally. Next we rode a chair lift partway up the mountain. 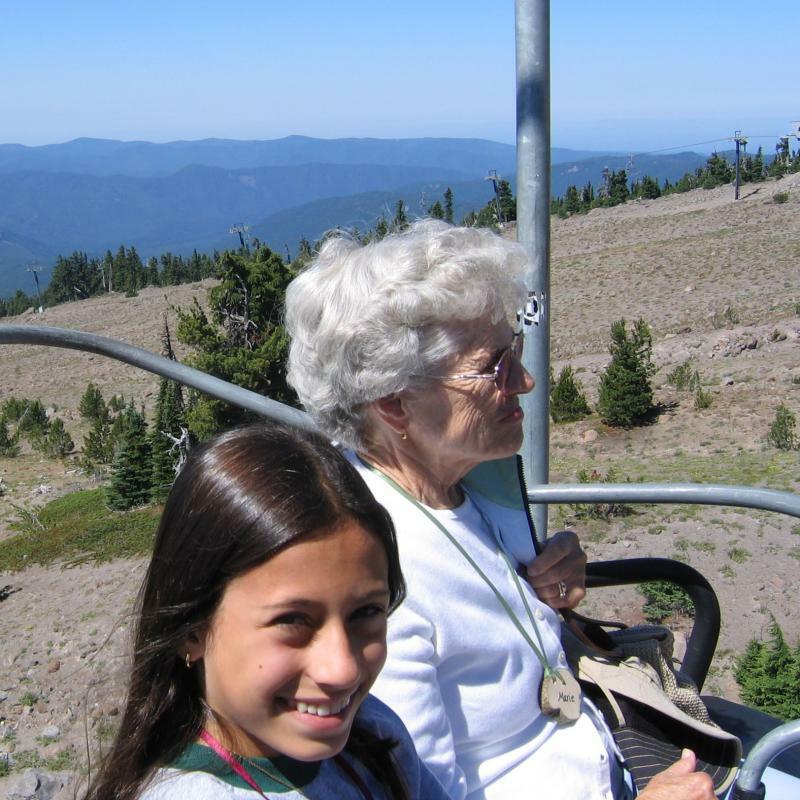 Rose feels completely at home on the chair lift since she does so much skiing during the winter. 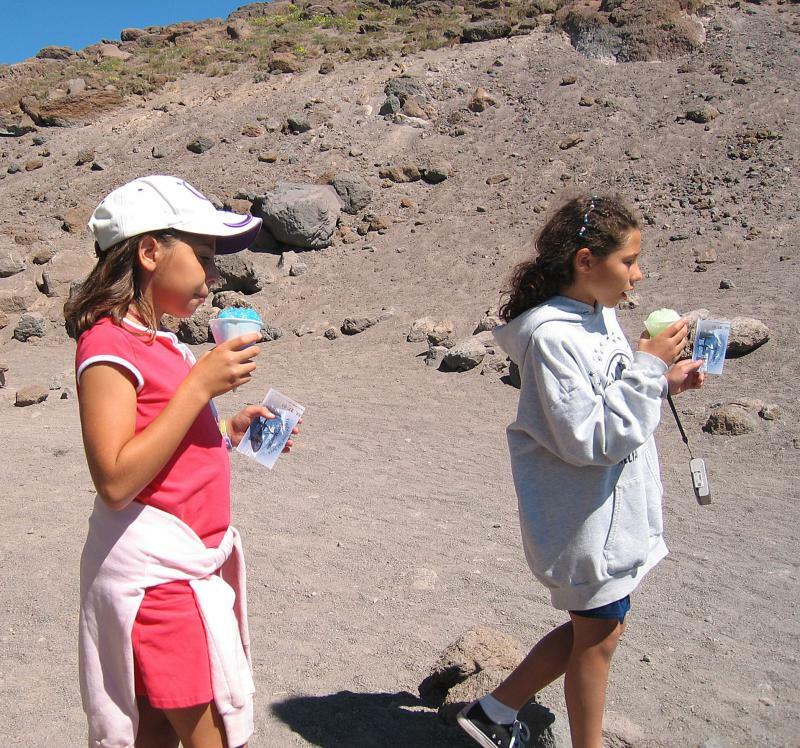 Sarah and Hannah are enjoying the free snow cones provided at the top of the chair lift. 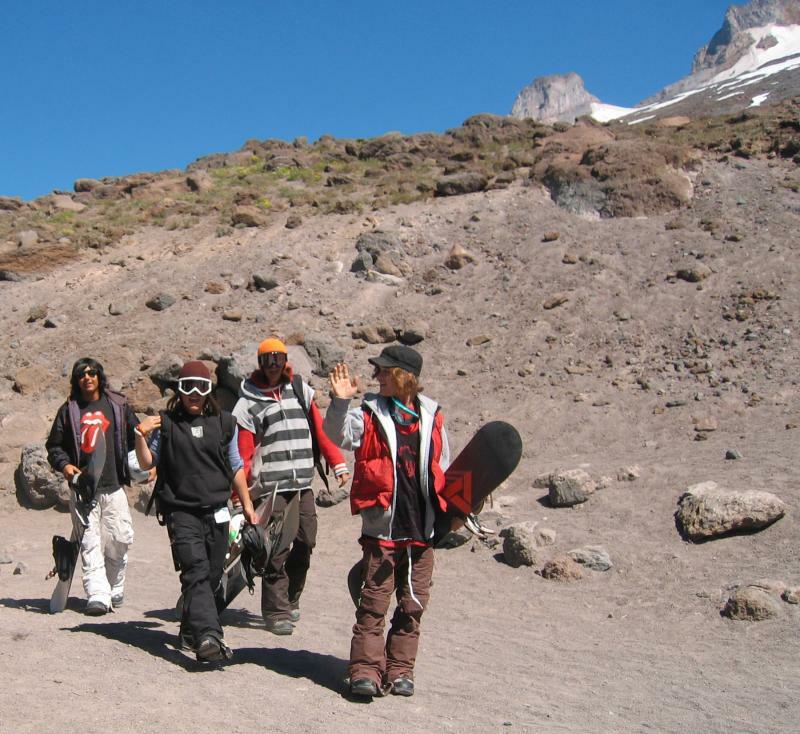 This is part of the snow boarding summer camp that is run a little further up the mountain. We were told that the fee was $1000 per week! I didn't know Marie's father worked on the dams! Free snow cones! Great fish pictures!